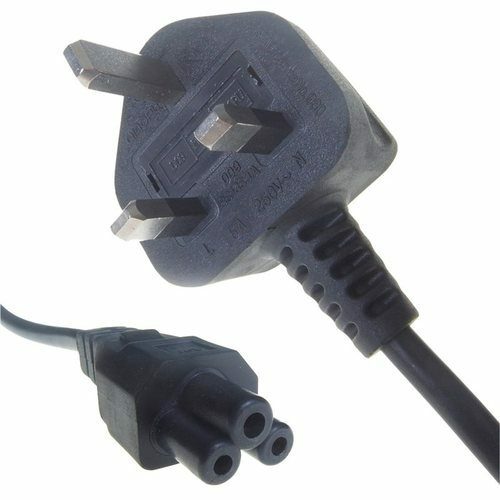 C5 Cloverleaf Mains Power Cables are widely used to power Kettles, Computers, Monitors, Printers, TVs, DVD Players and Games Consoles. Fully molded 3 Pin UK Plug Top with 5A BS1362 Plug Top fuse fitted. The cable and lead is manufactured up to the Specification which will take up to a 10A load. Please also see our many other IEC and Computer products such as our Black IEC Extension Cables, Cat5 and Cat6 Cables and Computer Hardware such as Keyboards, Microphones and Mice. I ordered this to replace my broken laptop adapter lead. What can I say, ordered on the Sunday and arrived on the Tuesday and exactly as described! Will be back..